We believe Mac & Windows based operating systems can live in harmony in todays businesses, you should no longer constrained by their differences. We don't just preach, we practice, our team of experienced support engineers use both Mac & Windows based devices on a daily basis. Many of our clients ask us the question 'can I buy a Mac laptop for work?' our answer is YES. Apart from a few specific Windows only applications, we find the majority of our clients can switch to using Mac products without issue. Many of our clients use a Windows desktop in the office and choose a lightweight Apple Macbook to work on the go and from home, switching between them at will. Often a 'best of both worlds' approach delivers the best results, the reliability and flexibility of a Microsoft server delivering business grade services to both Mac & Windows based computers. 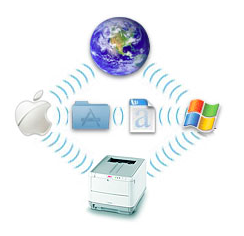 Services such as a business grade email exchange, seamless printer sharing, file sharing and permission control can be delivered, regardless of your preference of Mac or Windows. Contact us today to discuss your network and requirements and see how Intune Computer Services can bring your workforce together.